organizations fighting for climate policies grounded in equity and justice for communities and working people. 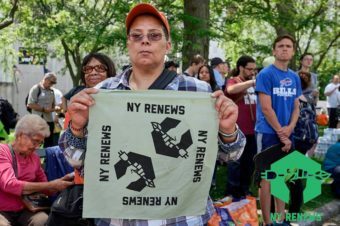 This year we are asking all New York State elected officials to stand with their constituents and their communities and not with the big polluters. It’s time to tackle the climate crisis and pass the nation’s most ambitious climate legislation, the New York Climate and Community Protection Act — a bill that will move New York’s economy off of fossil fuels entirely in the next 34 years, create thousands of good jobs, and give real protection to workers and low-income communities. On December 8th, NY Renews will be holding an NYC town hall to engage New Yorkers and elected officials from across the five boroughs. Come make history with us. Join our email list to receive action alerts and campaign updates!